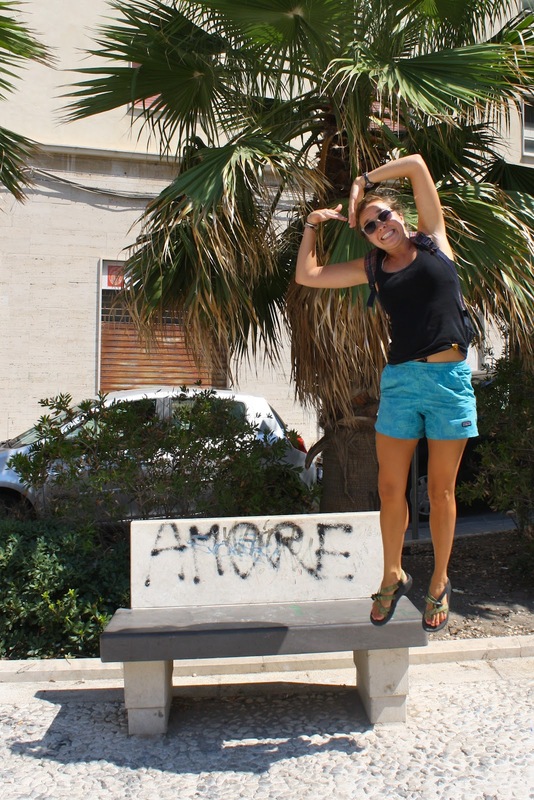 Jess had already been to Siracusa once on her visit to Sicily but, believe it or not, she liked it enough that she asked to go back! 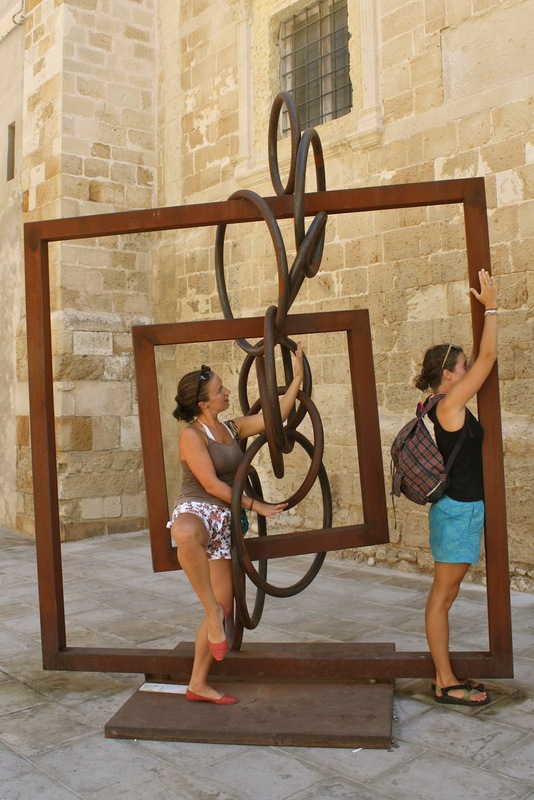 Besides, Sarah hadn't visited Siracusa yet. 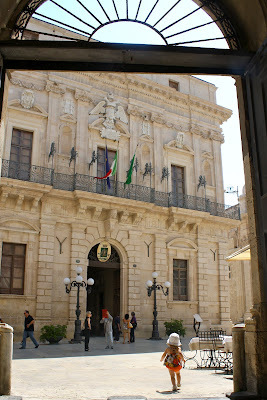 As Siracusa is becoming my favorite town to visit on the eastern coast of Sicily, I was totally game. By the time we reached the main piazza of the town, little Lena was getting tuckered out. She found some shade and laid her little head down to rest right in the middle of the piazza. Definitely time for a 10am gelato break. Siracusa has a little strip of beach and a pier. Jess and I were so hot and sweaty on our last visit that we jumped off the pier, clothes and all! This time we planned ahead and brought our swimsuits. The water this time of year is like bathwater and, in this group, no one was complaining. We finally headed back up to the beautiful Duomo Piazza for lunch at my favorite restaurant: The Fox and the Grape. It's very Italian and pretty much all pizzas, but they're trying to be modern and trendy (quite successfully), and the combination is totally charming. Also, their four cheese pizza is to die for. "Mom, I'm so hungry! But I guess I'll content myself with drinking water from a wine glass until the pizza arrives..."
And finally: "Sarah, help me do something modern on this" & "We love Italian graffiti because all it [usually] says is, 'Love!'" It looks like you had a beautiful day. I wish I was swimming in that glorious sea now....instead of sitting at home watching as it continues to rain....but I shan't complain - I get to see your gloriously warming photographs and know that I will be close to the Mediterranean soon! 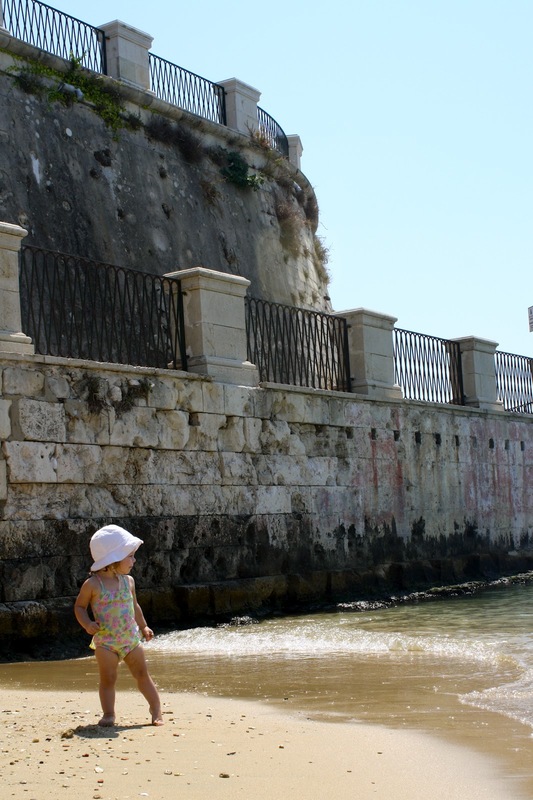 I don't remember the little strip of beach in Siracusa...but I guess it wasn't warm enough to swim when we were there.